I found my biggest treasure thus far buried in the sand. I was having a pretty good day, finding a few blues to add to my collection was great. Minutes before leaving I eyed something in the sand, I had to retrieve a piece of drift wood to dig it out as some of the sand was frozen. How exciting it was to find this great piece and for it to be blue is wonderful. 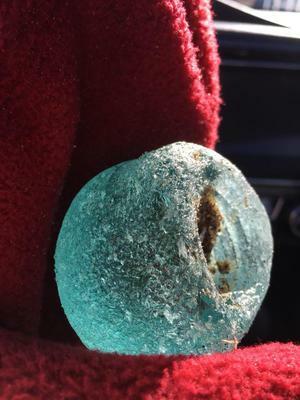 I'm thinking it is a glass door knob as it is hollow and has threads inside. I hear you Norma Wilson, it does definitely sharpen your skills. I can't wait to find another great piece! That is a very exciting find , awesome! Way to go , I think every time you find something like your piece, it sharpens your hunting skills for the next time. I love the anticipation. My old dog used to go with me & when I found an exciting piece, I would thank him for bringing me luck! 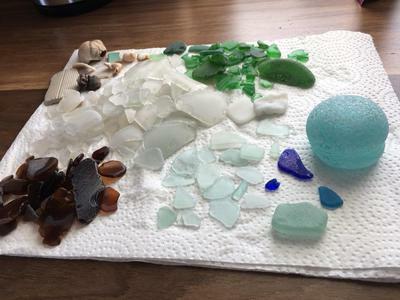 I spent all winter on the beaches and welcome noreasters for the beach turnovers...i found pounds of glass including pips which are great finds like ur nob...congrats on that find! Yipes! That is really exciting! Wow!